I love this salad! Also a fan of it from Sweet Tomatoes.I recently made a bunch of recipe cards for a wedding shower gift. I knew the bride would love this, so I went in search for a copycat recipe (which I never do). One thing different in their recipe, which I think makes a huge difference, is they blanch the broccoli. That explains why th Sweet Tomatoes version has no trace of bitterness. It's not necessary, of course, but I think blanching would be worth the extra bit of effort. Nicole!This is lovely! Fresh! And I digg your photos! 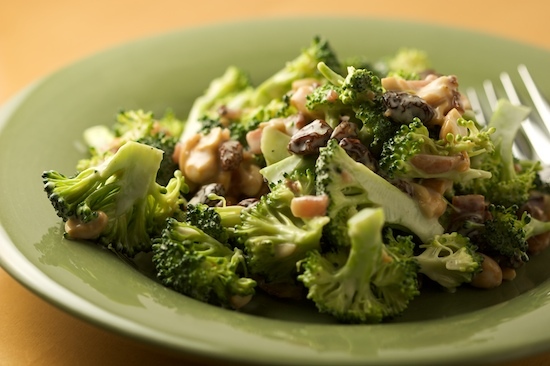 Nicole:I love this salad and it is my youngest son's favorite. For a little different texture, I've also used the "broccoli slaw" that you can get in bags at the market. Delicious!BTW, those Sweet Potato Buttermilk Rolls are truly amazing. They will be a big hit tomorrow!